This chapter discusses the use of smart antennas in Code Division Multiple Access (CDMA) systems. First, we give a brief overview of smart antenna classification and techniques and describe the issues that are important to consider when applying these techniques in CDMA systems. These include system architecture, array antennas, channel models, transmitter and receiver strategies, beamforming algorithms, and hybrid (beamforming and diversity) approach. Next, we discuss modeling of smart antennas systems. We present an analytical model providing rapid and accurate assessment of the performance of CDMA systems employing a smart antenna. Next, we discuss a simulation strategy for an adaptive beamforming system. A comparison between the analytical results and the simulation results is performed followed by a suitable discussion. Over the last two decades smart antenna technologies, referred to as Multiple Input Single Output (MISO) or Single Input Multiple Output (SIMO), have received much attention (Alexiou, 2004). Conventional cellular systems make use of omnidirectional or sectorized antenna systems. “The major drawback of such antenna systems is that electromagnetic energy is radiated unnecessarily in too many directions within the entire cell thus causing interference to other users in the system. One way to limit this interference and direct the energy to the desired user is to use smart antennas” (Osseiran, 2006). Smart antenna systems consist of an array of antenna elements whose signals are intelligently combined to exploit the spatial domain and improve the performance of a wireless system. For narrowband variety of these systems, the “basic principle is to multiply the signals at different antenna elements with complex weights before the signals are transmitted or when the received signals are summed up” (Pedersen, 2003). This allows a narrow beam (with gain) to be created towards the desired user and low side-lobes towards other users. Smart antennas offer a broad range of ways to improve the performance of wireless systems. For example, in the initial development of the system they offer enhanced range and in a longer term increased capacity of wireless systems. Due to the capability of spatial separation of signals, they allow different subscribers to share the same spectral resources (Space Division Multiple Access). The same capability of spatial separation of signals allows for mitigating adverse multi-path effects. Smart antennas can be generally divided into three main groups depending upon the level of intelligence. These are (i) fixed beam systems (Osseiran, 2006) or fixed multi-beam (also called switched beam) systems (Allen, 2004), (ii) phased arrays (Janaswamy, 2001) and (iii) adaptive array antennas (Godara, 1997). Adaptive implementations have better performance than fixed or switched beam systems, at the expense of higher implementation cost and complexity. The advent of low cost Digital Signal Processor (DSP) chips, Application Specific Integrated Circuits (ASIC’s), system-in-a-package or system-on-a-chip realizations have made adaptive antenna systems practical for commercial use (Kaiser, 2005). Consideration of the smart antenna features early in the design phase of future systems. Realistic performance evaluation of smart antennas according to the critical parameters associated with system requirements”. As far as first approach is concerned, smart antennas are already an integral part of Universal Mobile Telecommunications System (UMTS) and third generation Code Division Multiple Access (CDMA) standards and their evolutionary roadmaps (Boche, 2006). Furthermore, there is currently increasing interest in the incorporation of smart antenna techniques for IEEE wireless LAN/MAN (802.11n, 802.16 and 802.20) and smart antennas are expected to play a significant role in enabling broadband wireless communication (Alexiou, 2004). As far as second approach is concerned, performance evaluation based on accurate modeling with suitable simulation methodology is required. This chapter addresses these two approaches and provides an overview of smart antenna technologies for Code Division Multiple Access system. The remainder of the chapter is organised as follows. In Section 2, we first summarize the background information and then present the state of the art in smart antenna systems from key system architecture and performance analysis perspectives. In Section 3, we discuss smart antenna system modeling for CDMA and present a performance analysis based on analytical expressions, including simulation results for verification. Finally in Section 4, we present conclusions and identify some avenues for future work. 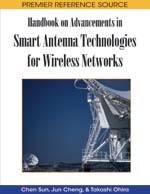 This section is devoted to the review of background information for smart antenna technologies. The emphasis is on summarizing the state of the art by focusing on well-chosen highlights, i.e. classification, system architecture and modeling and performance analysis aspects. The presented considerations are limited to the narrowband case. By the narrowband system, we mean the system whose operational frequency band is no more than a few percents.